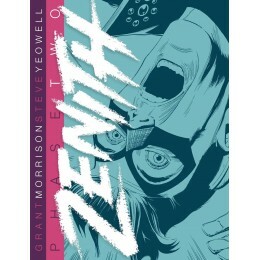 Zenith Phase 2, Grant Morrison's comics masterpeice with unforgetable art by Steve Yeowell, has been..
Sam Slade is a Robo-Hunter – a 22nd Century Private Detective specialising in tracking down defectiv.. In the swollen Euro-city of Downlode, Finnigan Sinister and Ramone Dexter are the best hitmen money .. The flight from Ganymede to Epsilon-6 Orbital should've been without incident – but a fault onboard ..
Deadworld was once a planet similar to Earth, until Judge Death and his brothers Fear, Fire and Mort..
Zenith Phase 4, Grant Morrison's comics masterpiece with unforgettable art by Steve Yeowell, has bee..